The team behind upcoming shooter Borderlands 2 first showed off their fancy loot chest last month at PAX East. The design came from community suggestions, made to look like the in-game loot chests, and they promised it would be filled with as-yet unannounced goodies. Well, now the goodies are announced. Nestled deeply in among the map, stickers, bobblehead, art book, steel case, lithographs, field notes, creature ID chart, and certificate of authenticity, the "Ultimate Loot Chest Limited Edition" also includes, if you look hard enough, a disc with the game on it. The big bundle goes for $149.99. 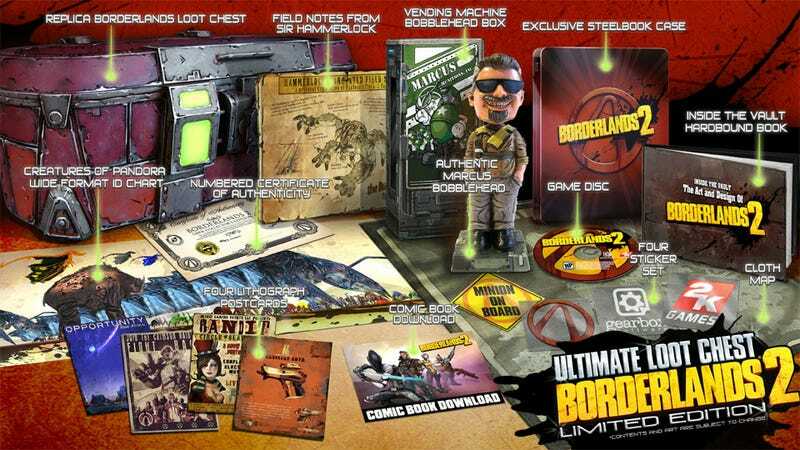 Meanwhile, the "Deluxe Vault Hunter's Collector's Edition," at a slightly more affordable $99.99, includes the book, the stickers, the map, the comic, and the bobblehead. Both special editions are available for all platforms (PS3, Xbox 360, and PC) and include additional DLC. All pre-orders of any edition of the game, including the standard version, will receive the DLC Mechromancer character, also detailed at PAX East, for free. Personally, I am nearly ready to start paying game developers to leave bobbleheads out of their collectors' editions. Those things are just creepy.